Bedros Atamian was the greatest tragic actor in the Armenian theater during the last quarter of the nineteenth century. Born on December 21, 1849, in Constantinople, he belonged to a lower middle class Armenian Catholic family. His mother died when Bedros was one year old. In 1857-1858 he went to the elementary school of the St. Salvador Armenian Catholic Church in the neighborhood of Galata. He was a precocious and voracious reader. After graduating from the school, they placed him as an apprentice, but his heart was not in learning a trade. He found his vocation in theater. After playing a silent role in 1864, he debuted in the play William the Conqueror two years later. Between 1867 and 1869 he played in various theatrical groups of the city. As most of his contemporaries, he was a self-taught actor, but he studied the theoretical approaches of European theater to improve himself over time. In 1869 he went with a theatrical group to Nor Nakhichevan (Nakhichevan-on-the-Don), in Northern Caucasus, but the venture ended in financial failure. During his absence, the great fire of Constantinople, in 1870, had ravaged the area of Pera (nowadays Beyoglu) and destroyed his father’s properties, who was ruined and died shortly thereafter. Atamian continued his theatrical career, and also dabbled as a painter to make his daily living. The newly built theater of Ortakeuy housed a brilliant theatrical group from 1872-1875, under the direction of Bedros Maghakian, with Atamian and the famous actress Azniv Hrachia as its main stars. 1879 would be a breakthrough year for the talented actor. Actor Gevorg Chemeshkian went from Tiflis to Constantinople, commissioned by the Armenian Theatrical Board of the city, to hire several actors. He came to an agreement with Atamian and two promising sisters, Siranush, who would become one of the most famous actresses of the Armenian scene, and Asdghik. For the next three years, he would win over the Armenian audiences of Tiflis. The newspaper Meghu Hayastani wrote: “He rules over the play and, like a bright lighthouse, he illuminates the stage.” The Georgian and Russian newspapers would also devote columns to him. Following the suggestions of the press and his friends, he left aside the customary melodramas and historical plays, and incorporated new and fresh works. The centerpiece would be Shakespeare, who had been played only since 1866. Hamlet, Othello, and King Lear would be the three Shakespearean roles in Atamian’s 250-strong repertoire. He later performed in many other cities, like Shushi, Rostov-on-the-Don, Moscow, St. Petersburg, Astrakhan, Baku, Odessa, et cetera, not only with Armenian, but non-Armenian groups. 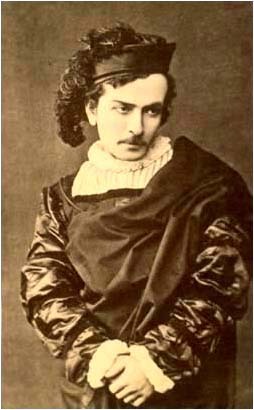 For instance, in 1882 he performed Hamlet with a French group in Rostov; the performance was in French, with Atamian playing Hamlet in Armenian. His performances as Hamlet and Othello would be highly praised everywhere by the audiences and the press, both Armenian and Russian, and they immortalized his name. Atamian was not only an actor, but also a theater scholar. In 1887 he published a study in Armenian, Shakespeare and the Sources and Criticism of his Tragedy Hamlet, which was the first of its kind. He also wrote poetry and a novel (posthumously published), although without great literary value. In mid-1888 he returned to his hometown, Constantinople, and the twenty-fifth anniversary of his theatrical career was celebrated on December 30, 1888. His last performance was a year later. In the meanwhile, he had taken a devastating turn in his life: he developed a condition in his throat that was attributed either to tuberculosis or to cancer. He was unable to work anymore, and fell into utter poverty. Thanks to the efforts of Russian friends from St. Petersburg, he was moved to the St. Nicholas Russian hospital of Pera in February 1891. However, medical assistance was not enough to save his life and he passed away on June 4, 1891. The great Shakespearean actor was buried in the Armenian cemetery of Sisli. Atamian’s name was later given to the Armenian theater of Tiflis, as well as to the theater group of the Armenian General Benevolent Union in Aleppo. Today, a street in Yerevan also bears his name.